Attend VMworld a few years ago and it would have been a case of rubbing shoulders with virtualisation and storage specialists keen to get the latest on where the market had reached moving data from a physical to virtual world. Last year, with the relationship with Amazon Web Services (AWS) taking centre stage, the focus was on cloud. VMware was looking to deliver the technology it had refined in the private cloud world into the public sphere with a tie up with one of the largest players in that market. There was plenty of talk about cloud again this year, with the relationship with IBM being promoted as another example of how VMware is looking to ensure it can be an option for an ever-greater number of customers. The core products of VSphere and VSAN are still key but there are plenty of other areas that the business now covers. In the future, the chances are that those sitting in the keynote session at future VMWorld’s could just as easily be networking and security specialists or come from a telco background. Pat Gelsinger, CEO of VMware, used his keynote at the event to outline the areas of growth for the firm. He highlighted an approach that involves not only developing its own technology portfolio, but also forming alliances with more vendors. When it comes to networking, the key plank of the strategy is around the NSX technology, which is being pitched as a way of unlocking the silos across businesses and reacting to the introduction of more devices. “At the heart of what we are doing is the network. When I think of VMware’s past, it’s about VSphere. When I think of VMware’s future, it’s about about NSX – which may be more important than what VSphere was over the past two decades. NSX is this connective tissue that turns datacentres into centres of data,” said Gelsinger. He said that VMware was widening the applications of NSX to cover containers and next-generation app frameworks, which is useful for telcos and will be able to deal with the emerging internet of things (IoT) devices and edge network activities. “NSX is the secret sauce that is propelling the multi-cloud future for us. If you are not already on the NSX, you are already late,” he added. VMware might not be the first name that trips off the tongue when talking about security, but the vendor is convinced that coming from the virtualisation angle will give it an opportunity to have a different take on protecting customer data. “When you think about our world today, the target is getting larger,” said Gelsinger, pitching AppDefence as a way to increase protection and ease management headaches. “Security spend is over $100bn and the fastest growing line item in the IT budget, yet the cost and number of breaches is inceasing more rapidly than spend. Something is broken – something is terribly wrong. You are spending more and falling further behind,” he said, adding that the tech industry had failed customers. The overall VMware approach is to try to stop “chasing bad” and “ensuring good”. Instead of looking for a needle in a haystack, companies should instead try to minimise the attack surface by having “a state of intended good” that is applied at the virtual machine level and makes it easier to isolate the threats that stand out against that background. By embedding more security in the infrastructure, working closely with specialist vendors and promoting better “cyber hygiene”, the expectation was that the firm could make a difference in this space. 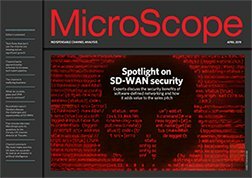 “We have never used the computer, which is our heritage, as a point to provide security – until now,” said Gelsinger, adding that VMware’s AppDefence offering plugged that gap. Partners will soon be given more opportunities to talk up the vendor’s capabilities in this space, with the product having only been out in the market for a month. Network function virtualisation (NFV) is the piece of the VMware portfolio that is giving the vendor the chance to make a play for more telco business, with the ability to provide a technology that sits on top of various blends of networking hardware and allows applications to run across the top. With most telcos happy using Openstack, VMware has made sure it has compatibility and can add in some extra features that carriers would like, including multi-tenecy that will make it attractive. “We are working with customers across the telco industry,” said Gelsinger, who then talked of its relationship with Vodafone as an example of the progress it had made in the sector. “If you think about the VMware vision, we have evolved it and refined it, but essentially the strategy we have been painting for the past five years is: to consume any device with any application from any cloud, built with intrinsic security,” he said. “We are expanding that to also transform the telco network and – with partnerships like Vodafone, and with NFV – we are seeing that the cloud world and the telco world are closer together than ever before. Our technologies are becoming intrinsic in the underlying networks of the service providers themselves,” he added. Gelsinger viewed cloud as a force for centralisation but, over the next few years, IoT and the expanding edge would make it shift back more to a decentralised world, which should give rise to the creation of new services. He said Toyota was an example of where it was working with a partner to try to make sure it could get its technology involved with the emerging smart car market. The mood around VMworld was upbeat and, with 12,000 odd attendees, it gave a glimpse of the size of the ecosystem. 500 partners turned up from the UK and Ireland, giving the strongest representation at one of these events. Gelsinger and other senior executives used their chance on stage and in the breakouts to paint a picture of a firm that was continuing to carve out its own path. According to them, VMware is determined to underline its independence from Dell EMC, looking to develop its own partnerships and alliances to ensure it could reach out to more customers.